Gladfield Malt has a strong, united and motivated team ready and waiting to help you by providing great customer service and the trusted high quality Gladfield products. Doug and Gabriella Michael are the sole owners of Gladfield Malt. 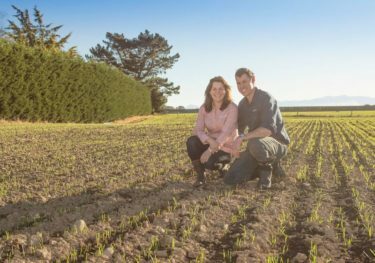 They have three children – Isabel, Frederick and Trevor who are enthusiastic about their future roles and ownership of Gladfield sharing their parents passion. Doug and Gabi want to acknowledge the great staff they have working behind the scenes to ensure Gladfield Malt is the best it can be. The staff don’t just make up the Gladfield Team they become part of the Gladfield Family along with all the growers, suppliers and customers. become a qualified Veterinary Nurse before finding her niche in Office and Administration areas. family while sampling the many great craft beers available. Andrew holds a NZ Certificate in Agriculture – Dairy Farming. He joined the Gladfield family in April 2018 and had spent the previous 6 years dairy farming. Andrew lives in Dunsandel with his partner and two children. His interests include playing and enjoying rugby and cricket. A huge sports fan of football, rugby, league and cricket and is a true one eyed Cantabarian supporting the beloved Crusaders as well as the Warriors. He enjoys dabbling in a bit of home brewing and his favourite word is Nemesis “it rolls off the tongue beautifully”. Annabelle is currently studying Supply Chain Management and Global Business at Lincoln university, she will complete her studies in June 2019. Annabelle started working at Gladfield Malt in September 2018 whilst studying and will continue to work here part-time throughout the remaining time of her study. On completing her study Annabelle will return to full time at Gladfield Malt. Annabelle comes from a farming background growing up in Wanganui on a sheep and beef farm. Caleb is the Production Manager at Gladfield Malt where he manages the production staff and day to day operations of the malt-house. Caleb was a trained chef before completing a Bachelor’s Degree in Food Science from Cornell university in New York. He joined Gladfield Malt in 2014 by dropping in for a tour and has been here ever since. Starting as the Laboratory Manager and moving his way up through the production roles. Caleb has completed the Diploma in Brewing Modules through the IBD and enjoys judging beer competitions both in New Zealand and internationally. At home he is the father of two young daughters and an avid home brewer/Gladfield recipe tester. David started with Gladfield Malt in November 2014 and lives with his Fiancee, son and daughter. Interests include snowboarding, rugby, softball, camping with his family and exploring NZ and generally getting amongst it. Originally from Auckland, Hayden balanced a career in consumer electronics sales with a full throttle passion for craft beer and brewing. After earning a Post Graduate Certificate in Brewing, and with many years of home brewing experience under his belt, Hayden jumped from the corporate life in 2016 to take up a job as a brewer in Sydney. With his role came experience using Gladfield Malt in a high-profile brewery and introduction to the folks who made the best malt in the world – Doug and Gabi. Hayden is based in Sydney with his awesome wife and two kids and joined the Gladfield family in January 2018. He’s a nut for everything to do with beer and brewing and has the best job in the world. He loves his family, Star Wars, food, falling off skateboards and celebrating All Blacks wins. Jan comes from Germany, enjoys Soccer, scuba diving, hiking, fishing and of course beer drinking. He joined the Gladfield family in November 2018. Jan has trained as a chef in Germany and has a background in Hotel Management. After High School Kelly studied Pharmacy training to be a dispensary technician, she left this to start working in Horticulture for 5 years. Kelly grew up on a small stud sheep farm near Springtson. She currently lives in Rolleston with her partner and their Border Collie ‘Mac’. Kelly enjoys hiking/camping in the mountains and cooking and baking. Nigel has been involved in warehousing and logistics for over 28 years. He is an Accredited person by MPI (Ministry for Primary Industries) for inspection of imported sea containers. He lives in Dunsandel on a small block where he runs a few sheep. Nigel has three children and his favourite use of spare time is to explore the back country to combine hunting and climbing with hiking and looking for photo opportunities. Nigel started at Gladfield Malt in October 2018. Paramjot (Param) attended Lincoln University graduating in 2017 with a Graduate Diploma in Applied Science and also a Bachelor of Technology (Hons.) in Biotechnology from India. Her interests are drawing, painting and cooking. She likes to participate in cultural events and has a great interest in calligraphy. Rowan started working for Gladfield in September 2016. He enjoys playing rugby, hunting and tennis and is also a member of the local Young Farmers. He lives on a dairy farm nearby. Savenaca (Save) comes from Fiji where he attended the Fiji Institute of Technology for Automotive Engineering and also the Victory Bible Institute – Practical Ministry Diploma. He is married with five children and enjoys watching movies, playing rugby and reading books. “Been enjoying my time so far at Gladfield, enjoying being part of a very good and happy family”. Tracey joined Gladfield Malt family in December 2018 having spent the three previous years working for BeerNZ in craft Beer Distribution, as well as previous work in Retail Management. She lives with her partner and two children. Tracey’s interests include reading, gardening and camping. Gabi is from Campo Grande, Brazil. She has a degree in veterinarian from UNIDERP University of Mato Grosso do Sul and was brought up on a cattle station mustering cattle on horseback. She visited New Zealand in 2003 on a quest to learn English and while doing this she got herself a husband and never looked back. Gabi is married to Doug, Gladfield Malt Director and has 3 children (Isabel, Fred and Trev). Her role at Gladfield Malt is Sales and Marketing Manager. Gabi is an avid home brewer and is the face of Gladfield Malt – if you enjoy our social media posts, it is credit to her. Doug originally started out owning and developing his own farm early in life after leaving school. His passion for growing things and engineering combined with a desire to be the master of his own destiny led to the building of a specialty malting plant and the formation of Gladfield Malt. Doug is heavily involved in the growth and sustainability of the business on an everyday level as both the Director and CEO of the company.